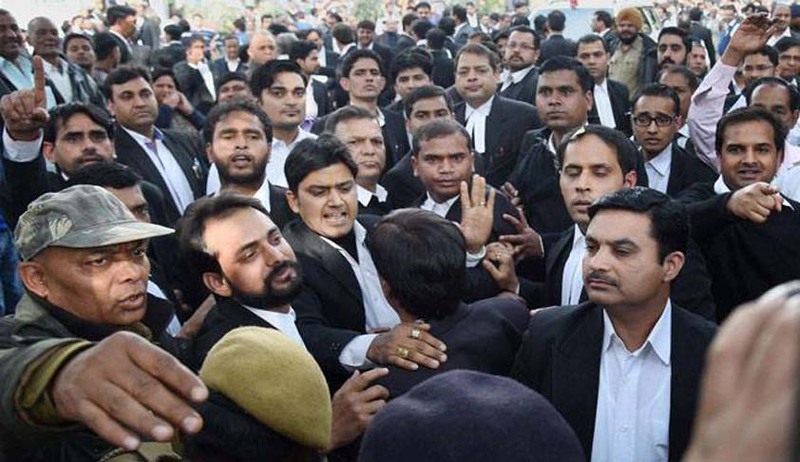 Reacting to the violence that ensued at Patiala House Courts, the All India Lawyers Union has written to Delhi High Court Chief Justice G. Rohini demanding an action against the mob which obstructed judicial work and assaulted journalists on Monday. The letter, written by General Secretary Mr. Som Dutta Sharma, notes that “lawyers affiliated to a particular ideology” had invited their followers through an “inflammatory message”. The lawyers involved in the scuffle are identifiable in the video footage, the letter claimed. The letter goes on to blame the Police personnel for being silent spectators of the incident, and thereby abetting the attackers. It calls for attention of the Commissioner of Delhi Police, to “discipline the police force under him” and take appropriate action against the erring police officials. The National Broadcasters Association also condemned the attack. “NBA condemns the assault by lawyers and others on journalists and cameramen, especially women journalists, who were reporting from Patiala House court yesterday,” a statement by the Association said. Journalists had organized a protest march against the attack, from Press Club of India to the Supreme Court and submitted a memorandum to its registrar seeking cancellation of licenses of lawyers involved in the assault. The lawyers also demanded Police Commissioner B.S. Bassi’s dismissal due to inaction on part of the security personnel. The JNU row had taken an ugly turn on Monday, when at least ten journalists and several students were assaulted by lawyers and a Delhi BJP MLA inside and outside the Patiala House Courts, where the sedition case against JNU Student Union President Kanhaiya Kumar was to be heard. Bar Council of India has taken a serious note of the incident and has decided to conduct an inquiry headed by a former High Court Judge. You may read the LiveLaw article here. The Apex Court has agreed to hear a Petition filed by a Social Worker and Alumnus of Jawaharlal Nehru University (JNU) seeking immediate intervention of the Court in the Patiala House Court incident. You may read the LiveLaw article here.